Today, we have a headline winnar!!! HARRISBURG, Pa. (AP) – HARRISBURG – A man charged with drunken driving on the way to a drunken driving hearing said he probably will have to quit drinking. I’d say there’s a 70%, maybe 75% chance he’s right. 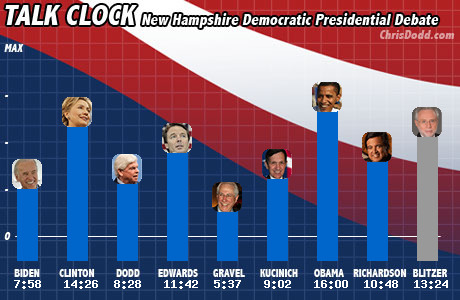 The Chris Dodd Presidential campaign web site has an interesting chart of candidate talk times at the latest Democratic debate. Since I’m enjoying the whole LOLcat phenomenon so much, I feel obligated to point out the origins of LOLcat, as told by Ape Lad. Not many people know this, but my great grandfather Aloysius “Gorilla” Koford, was also a cartoonist. From 1912-1913 he produced a comic strip which was featured in 17 newspapers, including the Philadephia Star-Democrat, the Tampa Telegraph, and the Santa Fe Good-Newser. The strip was entitled “the Laugh-Out-Loud Cats” and featured the exploits of one Meowlin Q. Kitteh (a sort of cat hobo-raconteur) and his young hapless kitten friend, Pip. The strip did not last long due to a run-in my great-grandfather had with none other than William Randolph Hearst. 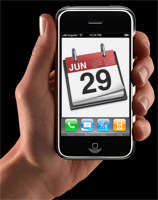 In case you haven’t been keeping up, on June 29th you can get your iPhone, provided you don’t mind getting stuck with a 2 year contract on a version 1.0 $600 cell phone. Hey, I’ll admit I could be wrong about how well this product will perform in the market, but to exceed my expectations, I think the market will need to be filled with idiots or folks with too much money for their own good. During an onscreen demonstration of the iPhone in Apple’s sprawling retail store here recently, an employee, clad in a black T-shirt, of course, surprised a potential customer. Most analysts believe that Apple will easily exceed its initial goal of selling 10 million phones by the end of next year. That has a high probability for proving my prediction wrong, too. I could have sworn I read that Jobs was aiming for 10% of the market. Well, I may turn out to be the idiot here – 1% is too easy given the hype surrounding this.